Throughout my career as an architect, I have been fortunate to visit many of the world’s greatest cities, including London, Paris, Rome, Beijing, San Francisco and Portland, Ore. What makes these cities great? Most prospered early in their history on waterfronts that supported trade and transportation. Eventual crowding forced organized transportation, park development, vertical growth and infrastructure. All great cities provide places for people to live, learn, work, play, govern and heal. Great cities grow in a thoughtful way. They are livable environments. I am proud that Dallas has accomplished much toward becoming a great city. Downtown and Uptown flourish with residents, retail, restaurants and services for the 24-hour population. Transportation options provided by DART and the trolley serve our needs to move about without cars or parking spaces. The Arts District and Klyde Warren Park have added vibrancy. Yet the development of interstate highways and toll roads has created significant barriers. 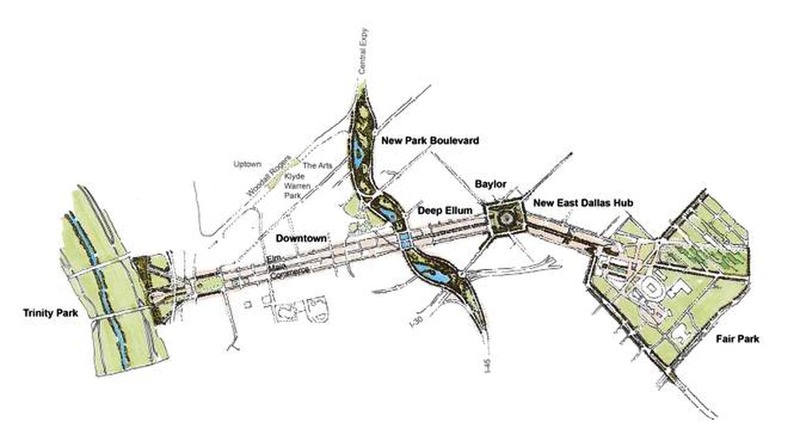 Just as Woodall Rodgers was depressed to leave the downtown streets intact and allow the development of Klyde Warren Park, are there other opportunities to connect resources and neighborhoods to expand our urban core? The Dallas Morning News. 8 July 2014. Web. 09 July 2014.